Parefeuille terra cotta tile flooring stretches beyond entry to dining room. 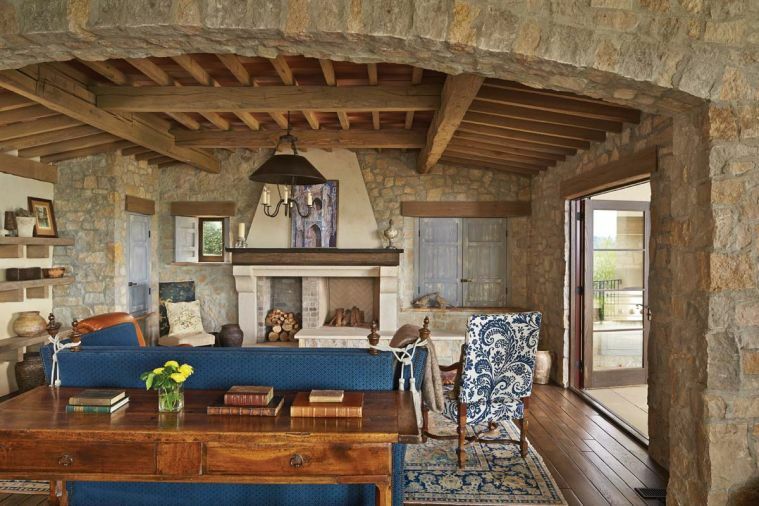 To keep with Tuscan home traditions, no baseboards were used. 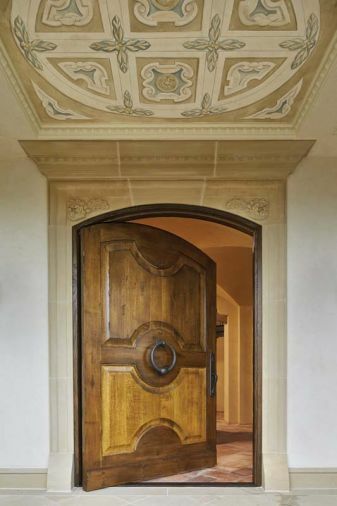 The Great Northwest Door Company crafted the arch oak pivot entry door crowned with a hand painted fresco designed by Hyde Evans Design and executed by Cathy Conner of Studio C.
The dining room chandelier was designed by Hyde Evans, based on an antique. Sconce by Woodland Furniture. Antique stone fireplace from Chateau Domingue in Houston. An antique desk and Louis XIV chair face off with a pale gold chenille sofa. The desk is from Dos Gallos in Los Angeles. The hanging fixture is Paul Ferrante. The wine tasting room located in the basement was completely remodeled to include this built-in sectional. 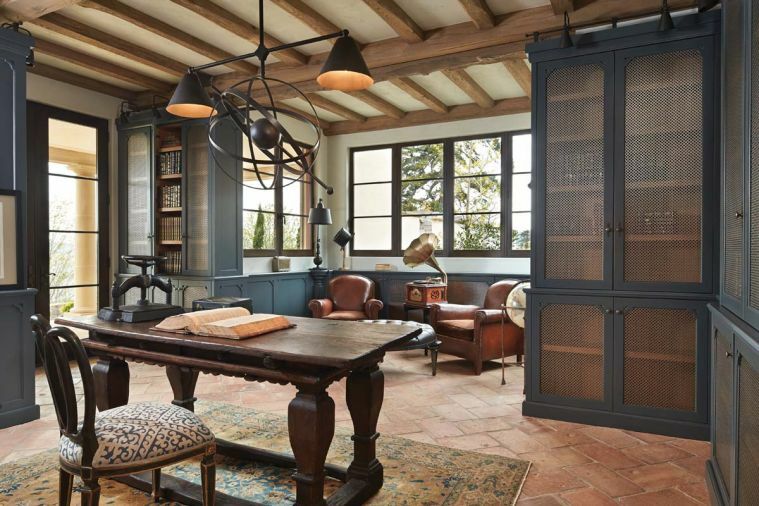 The antique table from 20th Century Gallery in London is paired with antique leather chairs from Heather in San Francisco. Chandeliers over table 2nd Ave. Lighting; Hyde Evans Design chandelier over the bar, fabricated by Paul Ferrante of Los Angeles. Sink is an antique bucket. 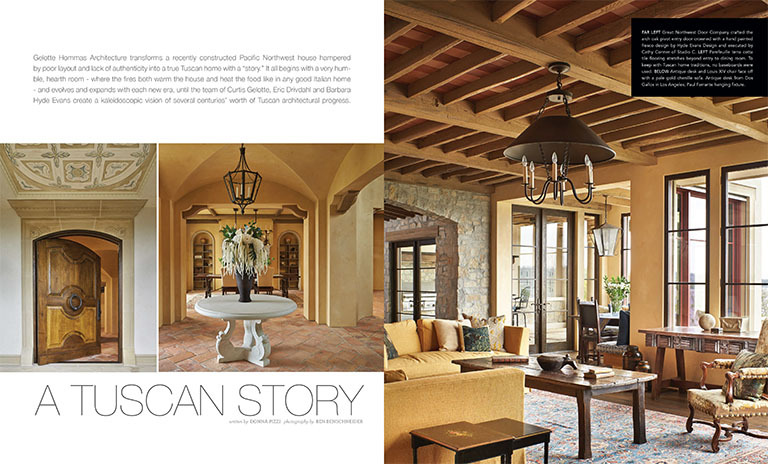 Moroccan tables and lanterns reflect Moroccan influence in Italy. Basalt flagstone tile flooring was sourced locally. 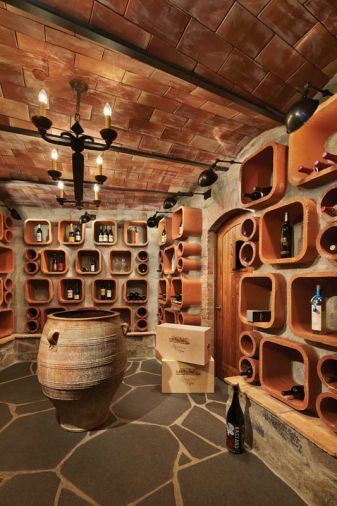 Chimney flue tiles double as wine bottle storage, adding a whimsical touch to the fan shaped wine cellar. “Edifice Construction did a great job with a challenging space,” says Gelotte, who used piles of mortar to keep the flue tiles in place. 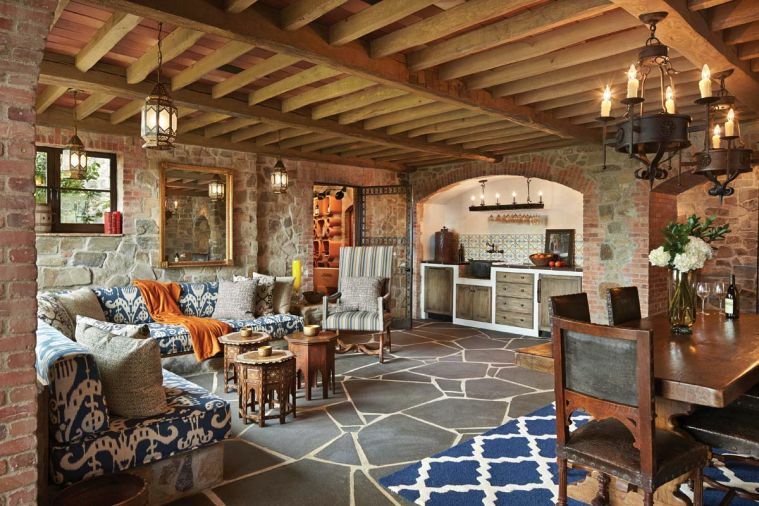 A traditional arched ceiling with terra cotta tile and steel beams is topped with concrete. The Hearth room fireplace was patterned after a fireplace in Minchilli’s book. When the faux shutter at right meant to hide the TV became problematic, the mechanism was shifted to the hearth. 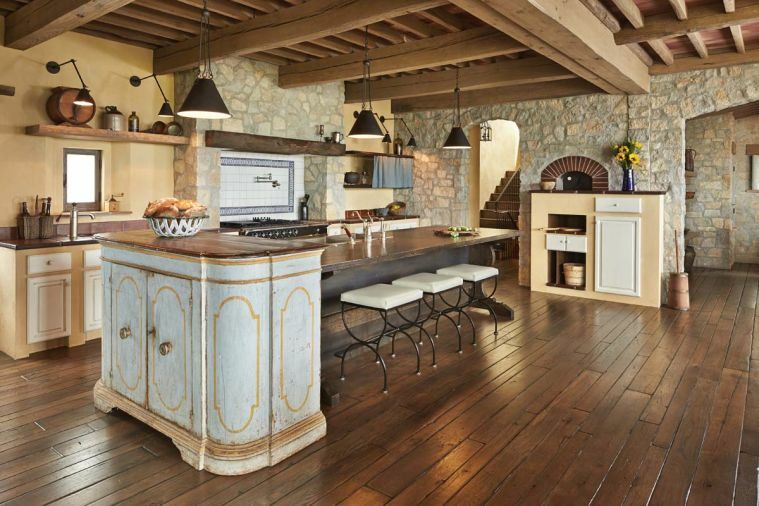 Tuscan architectural methods were challenging for many of the local craftsmen, especially those asked to re-create the appearance of typical late 17th, early 18th century kitchen cabinets that were made from cement or plaster and then fitted with painted wooden doors. The team designed the island to resemble an antique farm table; pendant task lighting designed by Hyde Evans. A very old antique cupboard with original paint abuts the island, mimicking the angle of the wood burning pizza oven set into the rustic stone wall opposite. 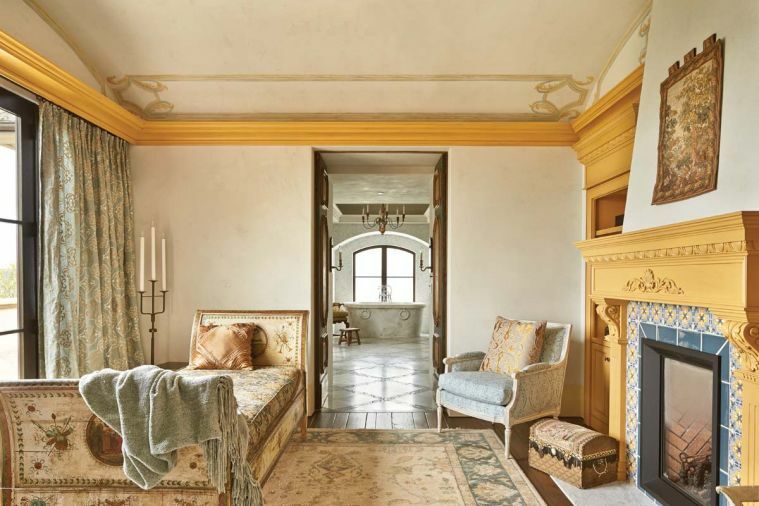 An indirectly lit period cove ceiling features Venetian plaster and reproduction chandelier - the latter is found replicated in the adjacent master bedroom’s vaulted ceiling. Carrara floor tile with ornate band designed by Hyde Evans. Antique upholstered chair found in San Francisco. Cast stone sconces in the master add authentic ambiance; headboard and screen design by Hyde Evans. Hand painted antique day bed in the new master sitting area draws the eye to French doors opening onto master bath. Architects designed fireplace and surround. Fireplace tiles installed by Ambiente Tile. 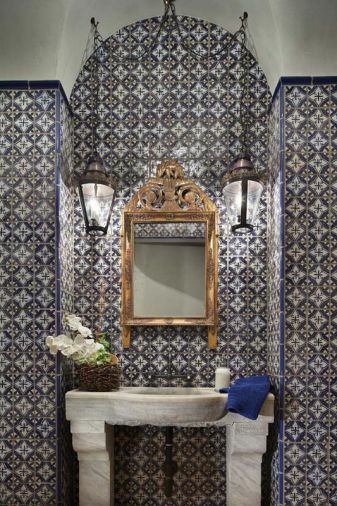 Antique mirror and sconces add shine and light to the powder bathroom’s blue and white hand painted tiles by Mosaic House. Industrial Centro faucet from Old and Elegant in Bellevue. The office had a complete makeover, adding built-ins with copper caned doors, oak beamed ceilings with plaster, rather than tile. 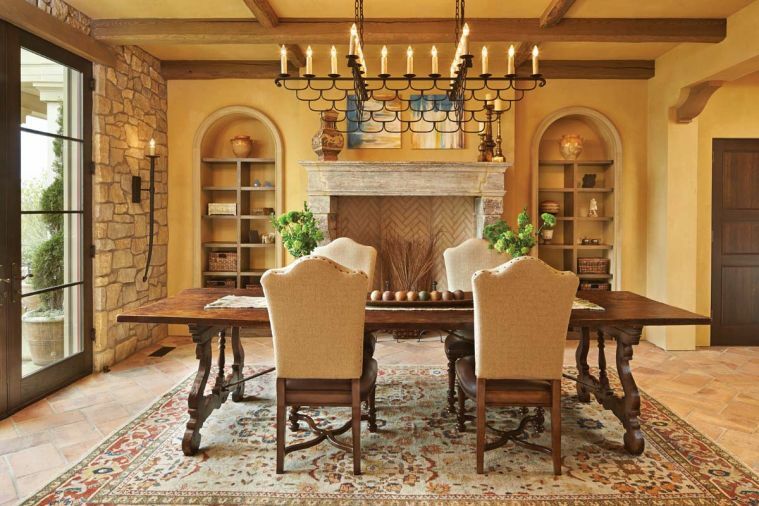 A built-in lamp rises out of the wainscoting alongside a pair of leather antique club chairs. The new house, whose historically correct additions have increased the square footage, is now 7,400 sq. ft. Nelson Evergreen Plastering completed the home with a stucco finish creating a late 18th, early 19th century look. Talk about a dream job! 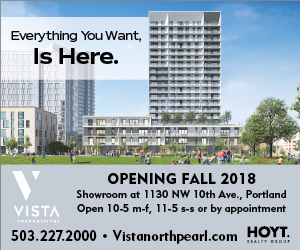 Imagine having a client ask you, as architects, to change the character of a recently built home into one that would feel as if it had been transplanted from a very rustic area of Tuscany to the Pacific Northwest. 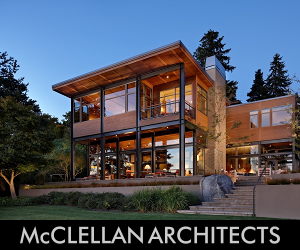 That’s the proposition Curtis Gelotte and Eric Drivdahl of Gelotte Hommas Architecture in Bellevue faced when a client who loves to travel to Tuscany asked them to remodel his Western Washington home. As part of their research, Gelotte and Drivdahl purchased Elizabeth Hellman Minchilli’s book, “Italian Rustic: How To Bring Tuscan Charm Into Your Home.” Minchilli is an American design writer married to Italian architect Domenico Minchilli, who collaborated on the nuts and bolts aspect of Tuscan building practices that became so crucial to the Seattle architects’ intent to build an authentic Tuscan home. 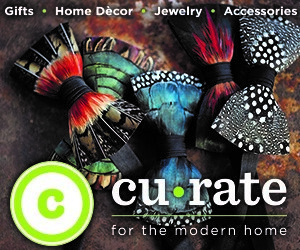 “My role,” says Gelotte, “was to conceptualize the remodel and some of its details. Eric was responsible for a lot of the thought that went into it.” Edifice Construction was the skilled contractor, who recommended Jonathan Orpin, founder and president of both New Energy Works Timberframers and Pioneer Millworks, who not only provided all the reclaimed wood, but also the whole timber package, precut and ready for installation. Gelotte created a storyline to help develop the architectural design that tracks the home’s humble beginnings as a small farmer’s cottage centered around the fireplace that heated not only the house, but also the food, to the more refined eras that followed. The essential idea, he adds, was inherent in Gelotte’s concept of the design, but the execution of it, like the storyline Gelotte created, flourished as the team worked together, room by room. There were times when the team had to drop back and redesign a given space in order to accommodate an unexpected antique find. 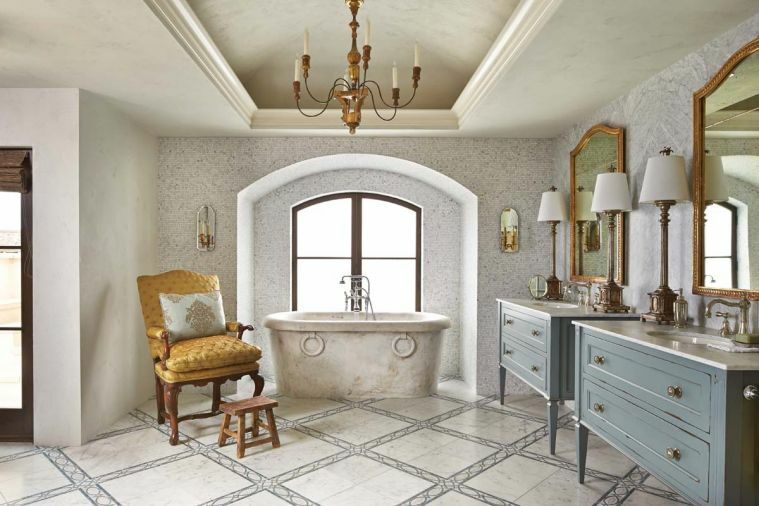 Drivdahl recalls having to redesign the configuration of the master bathroom so they could showcase a spectacular antique marble bathtub imported from Italy that Hyde Evans discovered in Florida and went to great lengths to have shipped safely to the Pacific Northwest. Set against a niche featuring hand chipped currier mosaic tiles out of carrara marble, the tub is the master bath’s pièce de résistance. The bookmatched carrara slab wall creates a perfect backdrop for the custom matching blue vanities and antique mirrors found at Wilson Antiques in Traverse City, Michigan. 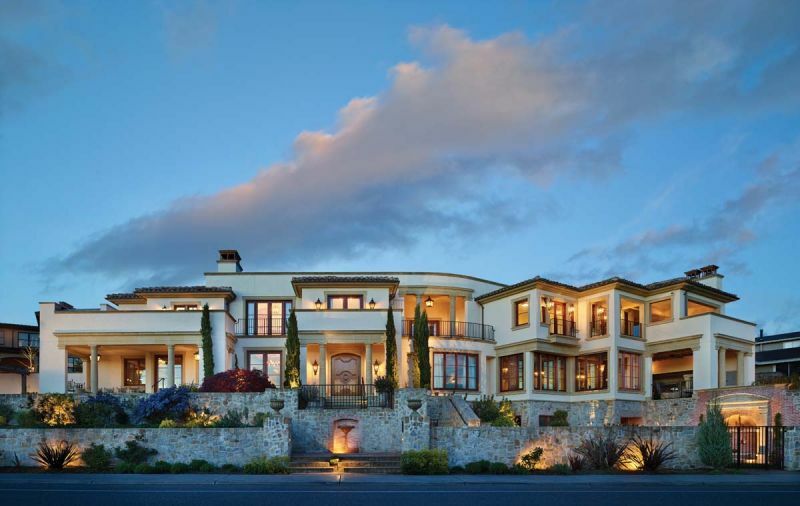 The homeowner loved the way Gelotte’s storyline gave the progression of architectural and design styles a semblance of logic, while simultaneously allowing the team to explore and create a multitude of period styles that initially attracted their client to Tuscan homes. 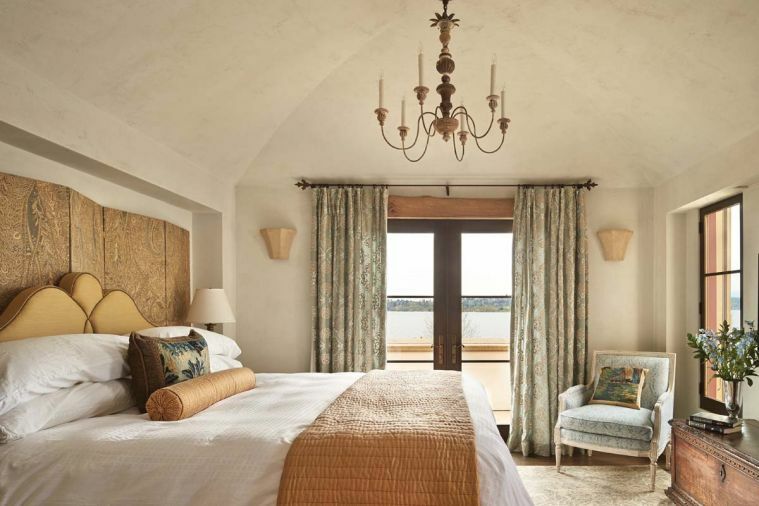 For instance, the blue and gold palette used throughout the rest of the house was softened in the master bedroom to create a more peace-filled ambiance. Other elements, such as the antique chair covered in Fortuny fabric and the fabric covered screen, add further layers of tranquility. The architects transformed the former master into a master sitting area off the newly constructed one that opens onto the stunning master bath. They added the fireplace and constructed the fireplace surround. 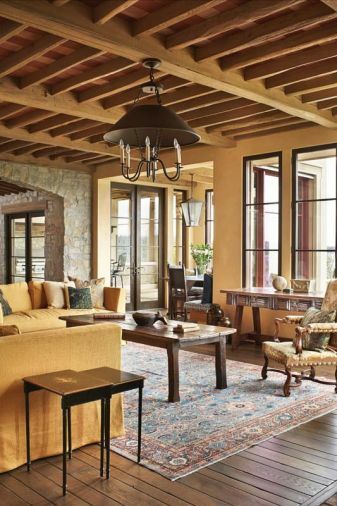 The ceiling painting by Cathy Conner, based on the photograph of a room found in Tuscany, enhances the 19th century style. Playing off the homeowner’s love for travel, the library has key elements that tie to that passion. Hyde Evans’ custom designed light fixture features a metal armillary sphere that symbolizes his passion for worldwide travel. Not seen - behind the library table/desk - are framed antique maps that echo that desire. The blues found in the library run deeper - reminiscent of the oceans traveled - and the serenity water provides. A heavy antique table with sturdy legs and carved scalloped apron was a Brad Williams Antiques find in Seattle. Copper wire caning fills the doors of the built-in bookshelves - some open some not. 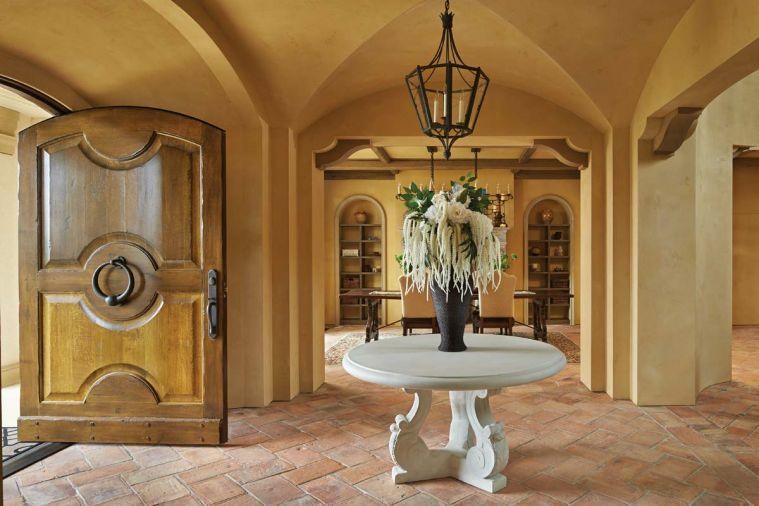 The structure of the stunning powder room, located between the entry and the family room and above the wine cellar, was designed by the architects. Hours and hours went into the selection and layout of the majolica tile by Hyde Evans, which is perfectly juxtaposed with an antique carrara marble pedestal sink from Italy.